is a small, attractively designed air purifier. It offers all the advantages of HEPA filtration in a small package. It is very efficient at cleaning the air in a small room. If you are looking for good performance at an affordable price, look no more. The Alen Air t100 meets both of those needs. It also has an attractive and stylish design. The t100 is 6" X 10" x 15" making it quite small. In fact, it is small enough to fit into a backpack. It only weighs 8 pounds so it can be easily moved to different places. It is designed as a desktop air purifier. Its size and weight allow it to fit comfortably on top of a desk or a table. We don't recommend keeping this air purifier on the floor. In a high traffic area it could easily be damaged. This machine is recommended for rooms 125 square feet or smaller. So it will be great in a dorm room, small bedroom, or office cubicle. We don't recommend using it in a living room or other large room. 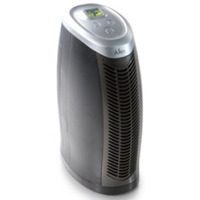 The Alen t100 uses HEPA filters to clean the air. These filters can remove 99.97% of particles from the air. It will remove pollen, dust, dander, and other allergens from the air. These HEPA filters are combined with an activated charcoal filter. The charcoal filter helps remove odors and chemicals from the air. These filter are combined into one filter. They should last somewhere between 6 to 9 months before needing to be replaced. There is an indicator light to remind you when to change the filter. Alen offers a silver ion replacement filter. This filter will kill bacteria, germs, and viruses in the air that passes through the filter. This filter claims to reduce airborne viruses that cause the flu by up to 50%. They also offer a MCP filter. This is an enhanced filter to remove odors from the air. To meet the requirements of the lifetime warranty the filter must be replaced every 6 months. There is an automatic filter replacement program. Sign up and they will deliver you a new filter every 6 months. This is very convenient. It means you don't have to remember to order a new filter. The Alen Air T100 HEPA filter comes in a set of 2. The T100 only requires 1 filter. The filter should be replaced every 6 months. The filter cost about $50 dollars. There is a Silver HEPA filter for the T100. It kills bacteria, viruses, and other organisms. It is about $60. The third filter is a MCP smoke and odor filter. It cost about $90. It is supposed to remove odors and smoke. Like all Alen Air Purifiers, the T100 has a lifetime warranty. The warranty requires you to replace the filter every 6 months. Its small size and light weight make it very portable. It includes a filter replacement light. It automatically cuts off when the cover is removed. The filter are very easy to change. It can only clean a small room. It is not as sturdy as we like. Don't keep it on the floor. Most customer review for the Alen Air t100 are positive. Common compliments were that it is very lightweight, doesn't take up much room, and very easy to use and maintain. There were very few negative complaints. A few people complained that it wasn't very quiet. However, more people said that it was very quiet. We feel good about recommending the Alen Air t100 to anyone who needs an air purifier for a small space. It will work great to remove common allergens and other particles from the air. Just please remember that this is for a small space. It would be perfect in a dorm room, office cubicle, or home office. It can clean up to 125 square feet. It will work better in a smaller space. It needs a room that is 10' X 10' or smaller to work best. We would recommend this for anyone with allergies or asthma. It will be especially good for college students living in a dorm room or a small studio apartment. Leave Alen Air t100 Page and Return to Alen Air Purifiers Page. Leave Alen Air t100 Page and Return to All About Air Purifiers Home Page. This is a medium size air cleaner from Alen Air. It uses a HEPA and carbon filter.